Hanoi (VNA) - The Electricity of Vietnam (EVN) said its total electricity output in January-July increased by 7.3 percent year on year to reach 112.6 billion kWh. The amount of commercial electricity output in the period was estimated at 98.1 billion kWh, up 8.55 percent year on year, including 15.1 billion kWh in July. In July, EVN ensured sufficient power supply for socio-economic development nationwide and private consumption. The corporation has worked closely with the Central Steering Committee for Natural Disaster Prevention and Control and the Ministry of Agriculture and Rural Development in regulating water release from major reservoirs in the north to ensure safety for downstream areas. 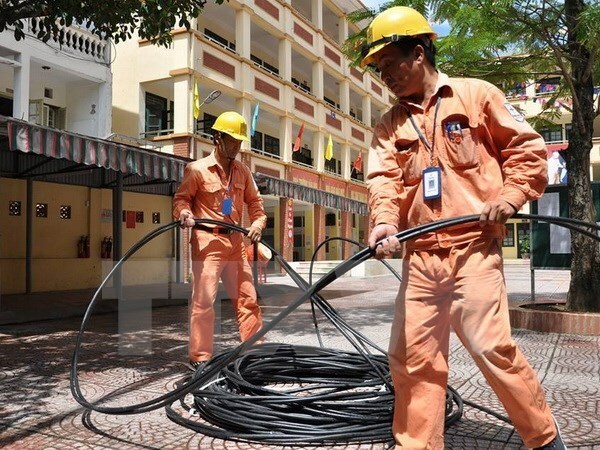 The group’s units have quickly resumed electricity supply for clients following natural disasters in Nam Dinh, Ninh Binh, Thanh Hoa, Nghe An, Ha Tinh, Quang Binh and Quang Tri provinces. In July, EVN put two turbines with a combined capacity of 675 MW into operation at the expanded Thac Mo hydropower plant and the Vinh Tan 4 thermo power plant, bringing the number of operational turbine in the 7-month period to seven with a combined capacity of 1,235 MW. The group started construction on 103 transmission works and completed 117 others to improve the capacity of the national grid. According to EVN, the daily power consumption in August is estimated at 573 million kWh.